The Motor Control Application Tunning (MCAT)Tool is a HMTL-based user-friendly graphical plug-in tool for Our FreeMASTER. 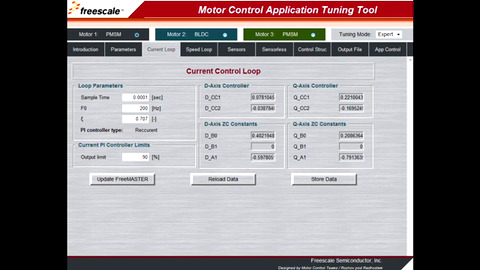 This tool is intended for the development of PMSM FOC and BLDC motor control applications, real-time control structure parameter tuning, and will aid motor control users in adapting NXP® MC solutions to their motors without a detailed knowledge of PI controller constant calculations. The tool is not provided as a standalone application, but it is a FreeMASTER plug-in component of featured reference designs and application codes.